Monday of this week I sent an audio CD on managing your energy via the U.S. Post Office to one of my clients. Tuesday, I found the same envelope that had I dropped off at the post office the previous day in my mail box with a stamp on it that read “Returned For 43 Cents Additional Postage.” This, on top of the $1.28 cents I had already paid. Why? Because they couldn’t bend the 9 1/2″ by 11 1/2″ padded envelope that was stuffed to the brim with one small 5″ by 5″ audio CD. And why would you need to bend it I thought to myself? Well let’s just say at that particular moment in time, the envelope wasn’t the only thing that was a little bent! Walking back to my office, I envisioned going down to the Post Office. And then I remembered my last visit. 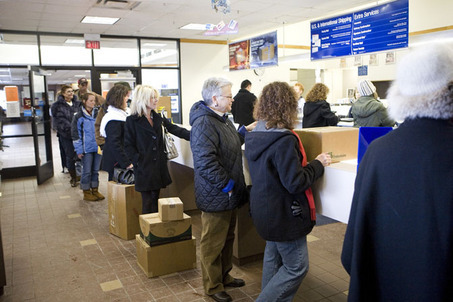 There I was standing in line behind 25 people watching multiple post office workers walking around or sorting mail while just one worker waited on customers. Once I was back in my office and after a little research, I compressed the audio file from iTunes and uploaded it to a free service called You Send It. Next, I typed in the appropriate email addresses and hit the send button. Within 2 minutes I received a confirmation of delivery. I called the client to let him know that he had an email with an attachment waiting for him in his inbox. It was then I realized that this process took less than 5 minutes and my client could learn how to start increasing his effectiveness while he was driving home … TODAY! Are you holding onto to people, processes, or policies, that prevent you from providing an extraordinary customer experience? Has technology left you and your business behind your competition … because you’ re afraid to embrace change or the unknown? Are your customers being inconvenienced because some of your employee’s have a personal agenda or a misaligned belief? Everyday 1000’s of customers are deciding to stop doing business with a particular company. The reasons are usually the same … poor service, poor product, or poor value. Are you giving your customers reasons to stay? Remember: It’s much easier and far more cost effective to keep a customer than it is to find a new one! PreviousPrevious post:Exceeding Expectations and Beyond …NextNext post:Giving Away Your Power … It’s In The Bag!